Due to the deteriorating weather conditions we are forced to close our offices today. There will be nobody available at Euroclad from 11am, with no orders processed or deliveries loaded. We will advise on our operating status tomorrow morning. Apologies for any inconvenience, we will return to business as usual as soon as possible. We have a problem with our main fax line – 02920 793 149. You will probably get a failed fax message of you are trying to send a fax into us. If you are worried that a fax may not have been delivered with your order – please call us on 02920 790 722 and we will check our records for you. Our very own Peter Willard has just completed the gruelling National Three Peaks Challenge in aid of local charity Tŷ Hafan. 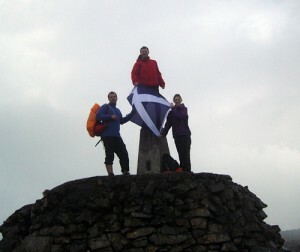 Peter is pictured at the summit of Ben Nevis. The total distance walked is estimated at 44 kilometres or 27 miles with a total ascent of 3,000 metres (9,800 feet). Tŷ Hafan is a children’s hospice based in Cardiff that offers comfort, care and support to life-limited children, young people and their families, helping them make the most of the time they have left. For more information about Tŷ Hafan click here.